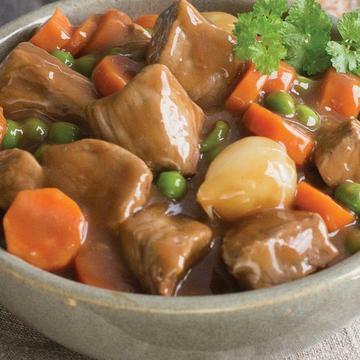 Our family-style Beef Sirloin Stew has tender Beef Sirloin Strips with sliced carrots, peas, pearl onions and red roasted potatoes in a rich beef gravy. In just 9 minutes, you can heat and enjoy this comfort food any time of the year. Do not thaw. Oven: Preheat oven to 350° F.Carefully remove film from tray before baking. Place tray on cookie sheet on middle rack of oven. Bake for 45 minutes. Carefully remove from oven and stir well. Return to oven and bake for an additional 20 minutes or until internal temperature reaches 165°F. Stir and serve. Microwave: Cut slit in center of film. Microwave on high for 7 minutes. Carefully remove film and stir. Microwave on high for an additional 2 minutes, uncovered or until internal temperature reaches 165°F. Stir and serve.